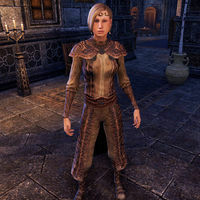 Countess Eselde Tamrith is a Breton and the current head of House Tamrith, one of the three main houses ruling over Rivenspire. She is standing in the middle of Camp Tamrith. "We didn't even have a moment's warning. By Arkay, the vampires. They struck so fast." I don't see Captain Janeve or Darien. "When the vampires attacked, Janeve and Darien charged right into the thick of the battle. I lost sight of them since I stayed to defend the camp, but I could hear Janeve calling out orders.Perhaps some of the guards saw what happened after that." I'll talk to the guards. "Here, take these healing poultices. You might as well help me tend to the soldiers while you're talking to them. I'd appreciate it, and so will they. After that, find my sister. She has a tendency to get into trouble when I'm not right beside her." Deliver the poultices and ask the soldiers for clues to finding Janeve. Countess Eselde Tamrith: "If you hurt my sister, I'll kill you myself!" Countess Eselde Tamrith: "Where's my sister? Where is she?" Countess Eselde Tamrith: "Thank the Light! Janeve, my sister. You're alive!" Countess Eselde Tamrith: "Wait... what happened to...? No, no! Not you, Janeve! Not you!" Captain Janeve: "What? Where am I? Sister? What has he done to me? What... what have I done?" Countess Eselde Tamrith: "Janeve. Oh, Janeve. We'll figure this out. Just stay calm." Countess Eselde Tamrith: "Please. I need your assistance." "Janeve... my sister... Reezal-Jul afflicted her with his blood-curse. She's becoming a... a vampire. Vampires are evil. Totally, utterly evil. But by Arkay, this is my sister!" "I wish there was another way, but I must be strong. Vampires are unholy. Evil. I can't let my sister become one of those... monsters! She has to die. It will be a mercy. Please, talk to Janeve. Try to comfort her while I pray over my decision." "This decision will come back to haunt us. Mark my words. Let's just get out of this vile cave and let the Light guide our path." "Pray that your decision to save my... sister... wasn't a mistake. I shall look to Arkay for tolerance, but I'm not sure I'll ever accept that this vampire is really Janeve." With Reezal-Jul dead, the refugees should be safe now. "Yes, our work here is done. Now we must turn our attention to the traitorous Baron Montclair. But before we go, know that I am grateful you saved my sister. I just hope that your mercy doesn't turn out to be a terrible mistake." You then receive Reezal-Jul's Dagger as a reward. "I find it hard to believe that Baron Dorell allowed a smuggler to dig a tunnel into his city—and right under his very nose! Still, it is our good fortune that this tunnel exists. The Light truly shines on those who need it." You find her inside Northpoint, hiding from the Montclair troops. "Letting a noble woman wander alone through a city full of vampires and bloodfiends. What was Skordo thinking?" His plan needs a little work. But we did find a safe location. Chirane Manor, near the inn. "Arkay guides our way, as usual. Are... are they all like this? The people of Northpoint? Did Lleraya turn them all into... these vile creaures?" I haven't found anyone who wasn't turned. At least not yet. "May the Light watch over them, praise Arkay. I can't believe that sweet Lleraya would do something like this to our people. What could have driven her to such horrors? I'll head to the manor and meet you there." Countess Eselde Tamrith: "Gather the others and let's meet at the manor. We have plans to make and I fear our time grows short. Mara preserve us." "Darien can't talk right now. I gave him something to relieve his pain. And to quiet him down for a little while. The man does love the sound of his own voice." "The end of my staff, right to the side of his head. Best way to quickly quiet a delirious soldier. He was making enough noise to give away our presence, and I was in no mood to fight a horde of those creatures." Did you find a key while you were bandaging him up? "A key? Yes. He was holding onto it rather tightly. I had to pry it from his grip before I could tend to his injuries.<nr>Is it important?" It's the key to the inn. "Arkay provides, bless us all! I heard sounds coming from the inn as I made my way here. Now we can get inside and see what's in there. I hope it's the survivors of this terrible disaster. I'd hate to think that Lleraya turned or killed them all." This page was last modified on 22 February 2019, at 00:19.